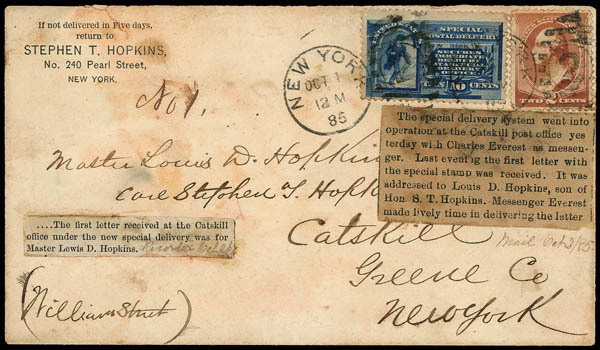 1885, 10¢ blue, First Day of Service Cover, tied by "New York N.Y. Oct 1, 1885" first day of service duplex along with 2¢ red brown (210) on cover to Master Louis D. Hopkins, Catskill N.Y., reverse with "Catskill, N.Y. Recd. 7 PM, Oct 1" arrival backstamp, manuscript "No 1." record number, newspaper clippings document this cover in the Oct. 2nd Catskill Recorder reading "The special delivery system went into operation at the Catskill post office yesterday with Charles Everest as messenger. Last evening the first letter with the special stamp was received. It was addressed to Louis D. Hopkins, son of Hon. S.T. Hopkins. Messenger Everest made lively time in delivering the letter. ", endorsed below "Mail Oct. 2/85"; small cover tear and light staining, E1 corner torn, Fine, ex-Fisher, Koslow, Markovits. Scott No. E1; $27,500 Estimate $10,000 - 15,000. ONE OF ONLY FIVE RECORDED FIRST DAY OF SERVICE COVERS OF THE 1885 10¢ SPECIAL DELIVERY ISSUE AVAILABLE TO COLLECTORS. DESIRABLE WITH NEWSPAPER DOCUMENTATION OF FIRST DELIVERY. Catskill N.Y. was one of the 555 authorized post offices that offered service starting on October 1, 1885. The stamps were available across the country to prepay the Special Delivery fee on letters to one of the 555 towns that offered service. Accompanied by 2008 letter from Markovits to prior owner concerning provenance. References: Discussed as cover #4 in Robert L. Markovits article in Collectors Club Philatelist, May-June 2001, pp. 133-139. 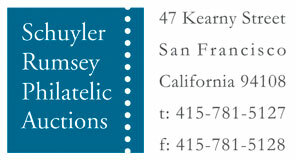 Listed as #5 in the Gobie census on page 18 of his Special Delivery book. 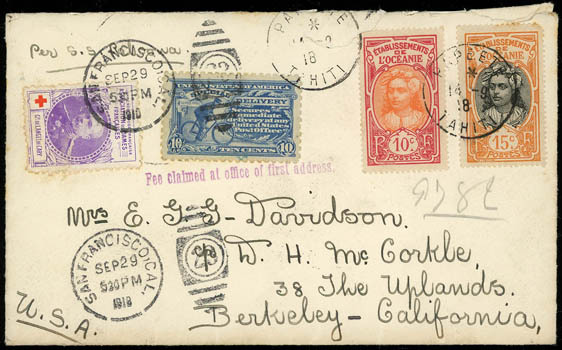 1918 Special Delivery Usage, likely #E10 (XF+) neatly tied to a 1918 cover from Tahiti to U.S.; with French Oceania 10c (#26) and (#29) franking; additional French Red Cross label tied to cover: all proper markings, slightly rough opening, Very Fine, Extremely Scarce Combination, a pretty cover.